However, after I finished cleaning I found myself feeling more motivated to get a little workout in. 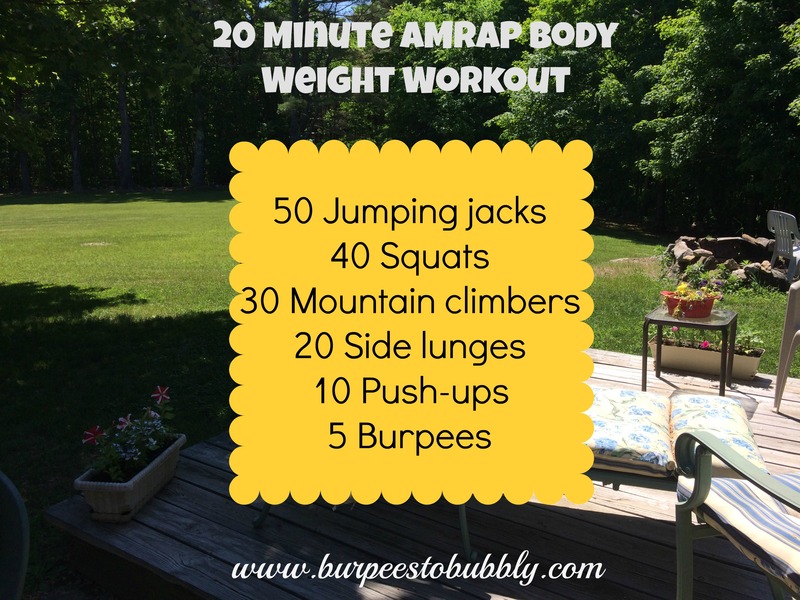 The sun was shining and I had the privilege of working out outside in private, so I came up with a quickie 20 minute body weight AMRAP (As Many Rounds As Possible) workout that left me sweaty, newly tanned and sore the next day. Win, win, win in my book! I mean, why change a good thing if it’s still working for you?! I did change up the exercises, but I love the descending ladder format because mentally it’s nice to know you’re working your way down, right?! Next time you’re running tight on time and are looking for something you can do quickly with just your body weight, I definitely suggest checking this out! With summer and weekend trips right around the corner, this is one you’ll surely want to take with you! Questions for you: Do you like to workout outside? Do you like descending or ascending ladder workouts? What’s your favorite way to get in a good workout quickly?